Who does five-time champion Derek Fisher think is the greatest player of all time? He joined Carlos Boozer and Nate Robinson of HOLDAT to discuss his answer. 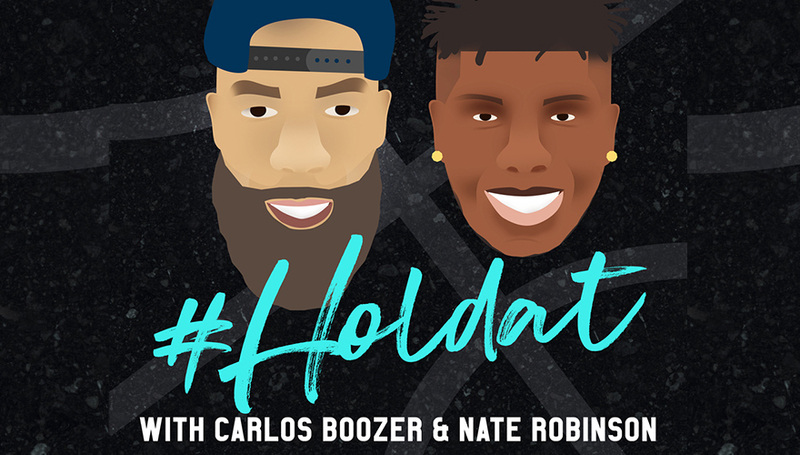 On this week's HOLDAT podcast, Carlos Boozer and Nate Robinson invited Derek Fisher onto the podcast and asked the five-time NBA champion who he thought was the greatest player in NBA history. Check out his answer and previous episodes on iTunes. Carlos Boozer: Fish I got a question for you. One of your brothers in life and obviously one of your teammates for a long time was Kobe. You got a chance to rock with one of the GOATS (greatest of all time) in Kobe. You know Magic (Johnson) and Kareem (Abdul-Jabbar) very well. You got a chance to play against Michael Jordan and LeBron (James). Who do you think is the best player of all time? Me and Nate have a crazy debate with my homie, so we go back and forth with this all the time but I wanted to ask your opinion so I could tell the fellas what you think. Derek Fisher: Yeah, nah man. It's a great question. We used to laugh at that question, right? Like nobody would even be in the conversation—at one point everybody was just like it's Michael Jordan, hands down. Guys that were before us or in an era before us like Kareem Abdul-Jabbar, he for whatever reason doesn't get that love. A lot of people talk about Bill Russell being one of the greatest winners of all time and how he should be in that conversation even though his stats aren't as good as other people's. But what LeBron is doing—I played against him and I coached against him so I've never been necessarily a cheerleader of his—but being on the outside and looking at his career over the last one and a half to two years, it's just hard not to at least have the debate. Nate Robinson: Yeah, it's debatable. That's what I said. Fisher: I don't like to ... you can't judge a case until it's closed. I think we still owe him the space to finish out his career in the however many years he chooses to play and decide then. But the fact that he's forcing us to think about it right now, I think that tells you everything you need to know. I played with Kobe, and to me he'd be in that conversation of those top five guys, the way they go about it and how they impacted the game. There's a lot of things that go into the greatest something of all time, it's not just numbers. It's like your impact on the game and how you influenced those coming after you. So what LeBron is doing is amazing and it's hard for me to pick one guy because it's no way for us to know, based on these eras and these different rules of the game, who would still do what they are doing or had done, if the rules were different when they played. Fisher: I'm not ashamed to throw LeBron into the conversation at this point. Robinson: See I think LeBron has the edge because—and this is what I think—of social media and TV is so easy to watch nowadays. You got your phone and you can watch it. Michael Jordan didn't have that back in the day. You know what I'm saying? If Michael Jordan in his prime played right now, he would be ... like that helps a lot. Like drastically. It changes everything. Robinson: Like some kids don't even know who Jordan is. Boozer: They've never seen him. They're so young. Fisher: And going back even more to Kareem Abdul-Jabbar. To Magic. To Elgin Baylor. To Jerry West. The amount of guys who were just amazing to watch. Larry Bird. Not to mention the changes in sports medicine and sports science. Guys like myself and you guys being able to play double figure years in the league without your bodies collapsing whereas a lot of the guys we grew up watching, after 10 or 11 years in the league their bodies couldn't physically get up and down the court anymore. So imagine those guys getting to play 14, 15, 18 years in the league healthy. Who knows what they would have been able to do. So it's a debate that we'll probably have forever and LeBron is definitely sliding up the list of guys you're definitely going to have to put up there. Robinson: I can't wait for the next guy you're going to have to put up there after LeBron. That's what I want. I can't wait to see the next youngest guy who's coming up. I can't wait to see who that person is. I hope it's my son (laughs).